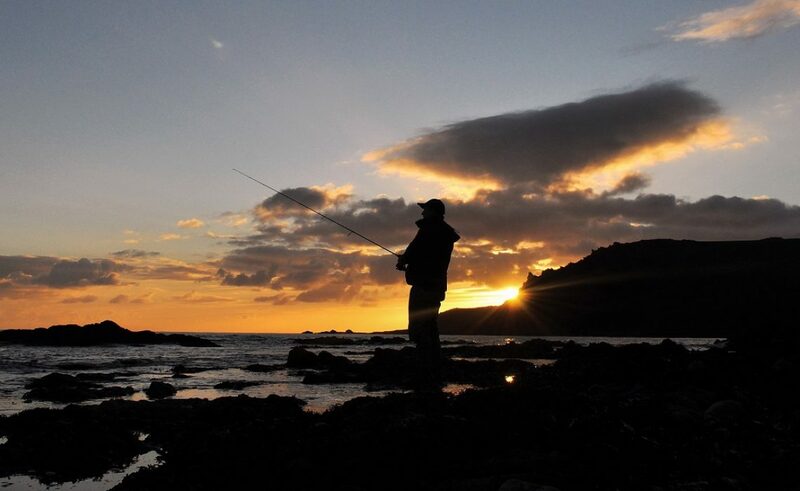 Along with the guiding (which I hugely enjoy) and commitments that keep me away from south Devon for half of every month, my personal fishing sometimes has to take a back seat. However, when I have managed to grab the lure rod I have been having a good time of it recently. The 6 lb lure caught pollack, the ‘follows’ from bass and near misses (for me and my clients) in those calm, crystal clear yet decidedly chilly conditions in mid-April to early May now seem like a distant memory. As I mentioned in a previous post, the air and sea temperatures have both increased and the wind/swell has continued to create a lot more movement to the sea. So what have I been up to? One of my recent clients (Rob) caught a beautiful near 4 lb bass from the beach in dusk/bordering darkness conditions here a week or so ago, and it was immediately after his official 8 hour session had ended that I managed a couple of nice bass – 58 and 61 cm respectively. Both were taken in darkness on the Daiwa Shoreline Shiner Z120F Vertice. The interesting thing about these two fish is that they were both caught (as was Rob’s) literally in the wave as it turned onto the beach – right in the gutter so to speak. In fact, the largest of the two nailed the lure as I retrieved it very quickly to avoid the lure being dragged into a large clump of weed that was on the beach! 61 cm and a smile! Following on from this success. A couple of days later saw me out on the coastline very early on a misty morning. This time I was fishing a stretch closer to home but still with the Ayu (sandeel-esque) Daiwa Shoreline Shiner attached. It’s amazing how much confidence a proven lure can give you, and with the sandeels seemingly on the increase, the theory of matching the hatch definitely appeared to be ringing true. The first bass (below) really walloped the lure just as it was beginning to get light (hence the rather dark photograph) right at my feet following a long cast across an area of flattish reef covered by 6 ft of water. I think the bass had followed the lure a long way before deciding to make a last-ditch smash and grab as it was foul hooked – possibly indicating that the bass initially intended to ‘stun’ what it probably thought was a nice lively sandeel wriggling away! The mark where I caught it from has been rather difficult to predict over the last few seasons. I used to catch a lot of bass from it on surface lures but they just don’t appear to hit them here anymore – maybe they’ve grown wise? Either way, the combination of the increasing light and very good water clarity (2 – 3 ft) ensured that my decision to set the alarm clock for 0345 was not in vane! This one really took me by surprise! Just as the mist was beginning to clear and the sun was trying to pop out, I managed to nail this larger bass from the same mark. Apologies that the image is slightly blurred. I think the shimmer of the fish and the sun glistening caused it but I’m not complaining – any bass on a lure is worthy of a photograph and I was very keen to get this one back in the water for various reasons. The lure that did the business is a shallow diving ‘lipless’ minnow called a Maria Squash 125 (see below) in the Holo Blue Mullet colour. It’s action is similar to a Tacklehouse Feedshallow, in that it seems to work best (rolling side to side motion) on a relatively slow retrieve but with the odd twitch. The Maria Squash 125 – the bass really wanted this one! 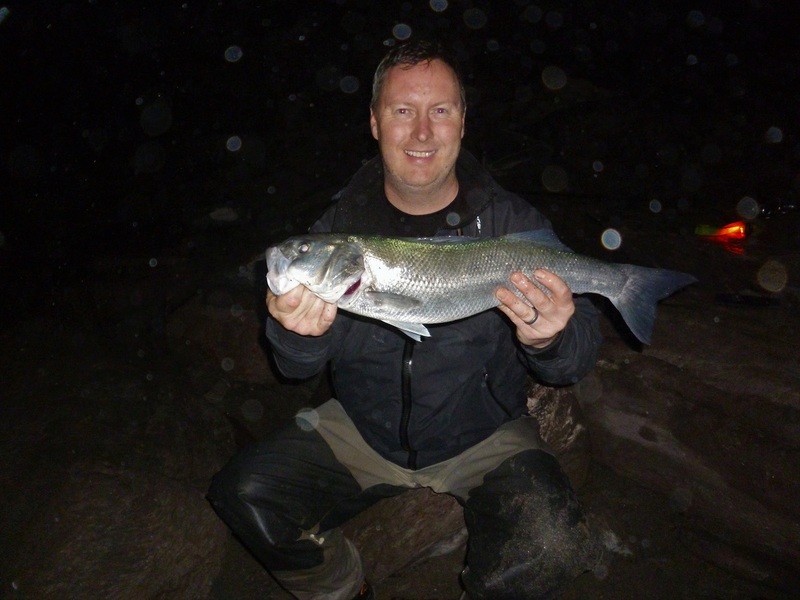 A more recent session saw me fishing from a beach, at night, in a small surf, on my return to the car following a fruitless session to a new mark… As you can see, I was using a Xorus Frosty II and just proves (as if it were needed) that even the smallest bass are natural-born predators! To hit a surface lure that is larger than its own body, in the surf at night is remarkable I think! I continued for another 30 minutes after this hoping its Grandma would appear but sadly, despite a couple of good hits – no other fish were landed. What a greedy little so-and-so! I’m making a concerted effort to mix up the type of lures I’m using at night rather than pinning my hopes on the white senko that was successful in mid-April here as I really think this exciting form of lure fishing will appeal to my future clients. Indeed, I have received a couple of recent bookings that will lead into darkness in the coming months therefore, I will of course keep you updated. I did try to tempt them with a subtle weedless DoLive stick when they fleetingly reappeared but it wasn’t to be. One for the diary though and amazing to see such wonderful wild creatures at a range of a few feet – I was stood right above them at one point, the blue fins unmistakably in the late afternoon sun that threatened to pierce the low cloud and mist. I will be returning to this mark again very soon that’s for sure! I did manage a tiddler (from the same beach that I caught the previous baby bass from) – this time on a Hokkaido Metsuki 130F before a small wave that caused a huge splash in my face as it hit the rock in front of me signalled that it was time to head home! Thanks for reading – next time, another successful guided session in harsh conditions with Henry Gilbey. Previous Bass on Lures for my Clients – Dusk does it!